Finnish humppa kings Eläkeläiset have been doing mischief since 1993. Despite their unbridled silliness, they have always busily released music: 12 studio albums, 2 live album, 7 EPs, 7 singles and a cult DVD are proof of that! To ease access for newcomers, Eläkeläiset decided to come forward with their first best-of compilation. Humppa is quite a serious thing in Finland, but Eläkeläset have always loved to spice this old men’s music with their very own, idiosyncratic way. Their Humppa Bingo compilation is a very thorough double album that features a couple of tracks from the Finns’ different releases. A closer look at the band history between 1994 and 2009 reveals that no epoch is neglected. There are a lot of cover versions of well known tracks from popular artists like Dead Kennedys, Deep Purple, HIM, but you’ll also get your share of interpretations from lesser known acts like X-Perience, Pauli Bidding and Kent, just to name a few. Of course the fun factor isn’t so big if you are not familiar with the original track. Even one-hit-wonders like Aqua, Spin Doctors and 2 Unlimited haven’t been forgotten. I credit Eläkeläiset for violating the most different genres from every possible era. Then there is Humppaelämää where they performed only their own material that also had its share of greatness, like Ona Vaan which they did later in a German version, but let’s face it: they are always at their best when covering. Of course everyone will miss the one or other song, like I would have liked to have their take on Van Halen’s Jump on this double album, but eventually a band with such a huge repertoire can’t make things alright for everyone. 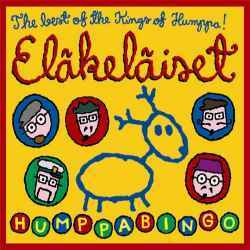 Humppa Bingo, although a double CD, is sold at the price of a regular longplayer. This is only one more reason why newcomers should have a go at it. Those who can claim to own everything Eläkeläiset ever did will hardly need this retrospective though.